Every evening afternoon will find me in the basement, furiously working on raising seeds and rooting plants. All of my rooted plants are doing well. I am coming up on the 28th day of rooting the plants from the workshop I attended in February. All of the plants look so great! 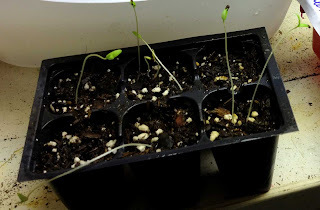 I am beginning to give them more sun each day and on the 28th day, either this Friday or Saturday, I will give them some extra water, fertilize them and then go to the next step. 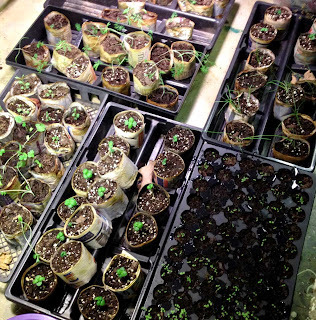 I just know I must not become too eager to root them because I want them to be well established. 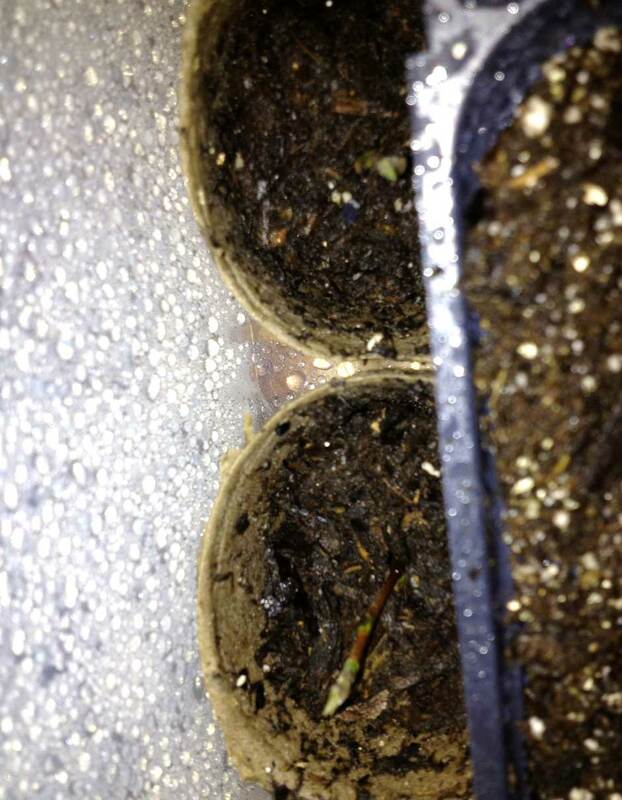 I have also rooted two tea plants, camellia senensis, and in another container I am rooting some blueberries. This weekend I will be going to my mother-in-laws and gather more plants to root. It is very exciting when they begin to sprout out. The tea plants above are just beginning to look like they will bud pretty soon. They are about 3 days later in the cycle than the other plants. Time will tell if they will be successful. But, Oh my goodness! I have so many plants all over my basement! Above are re potted plants in newspaper pots I have placed on trays and even trash can lids to easily move them around on days we have sun. I have also been rotating things under my one grow light. You have to use what you have! Some of the plants still have scrawny stems and are really in need of sun. 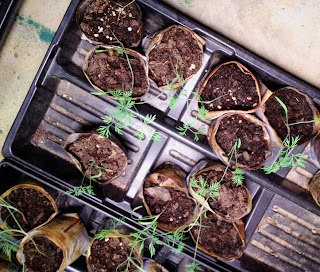 The dill above, the cilantro below and the onions are kind of scraggly. I also believe the allysum on the lower right hand corner of the photo (and in the shadow) must really need more warmth than my basement can provide. I need to be happy that they are holding steady and looking green. Placing them out in the sun for longer periods will come by this weekend or next week, I think. I am beginning to get a number of tomato seeds, growing into nice plants. Above are organic Sweetie tomatoes. 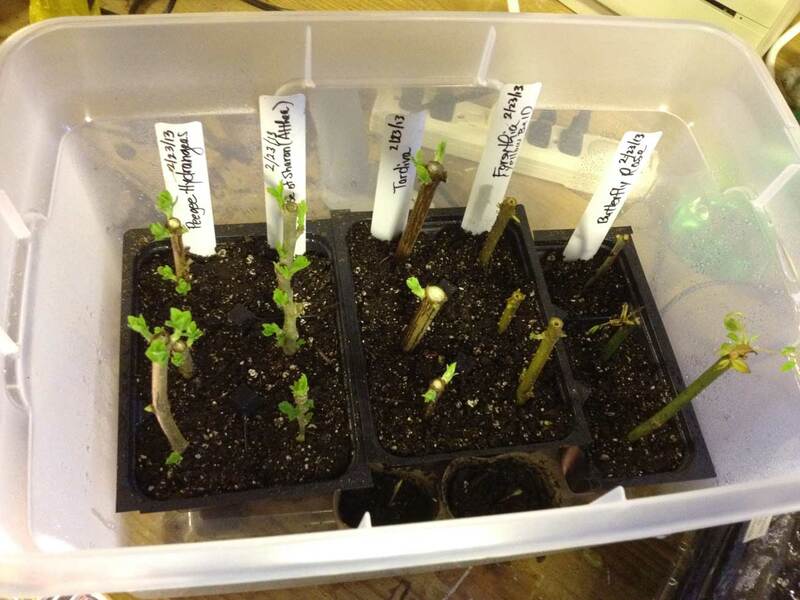 Right now, they are leggy but the grow lights should help give them strength and sturdy stems. I have dozens of tomato plants in various stages of growth above. Tomatoes are very easy to start indoors if you have heat and light. 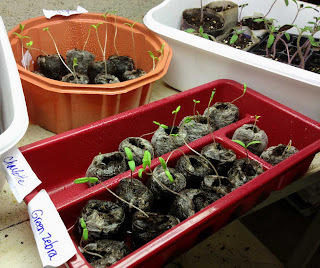 They make starting your own seeds very rewarding. It really looks kind of silly (and messy) to me because I have every kind of plastic tray that I could find to hold tomatoes. I particularly like the red silverware trays because I can separate varieties much more easily. 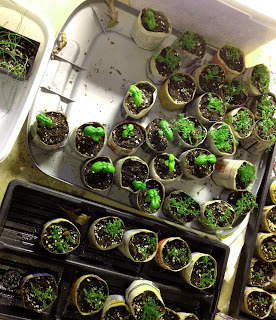 If they are right under the grow lights, they get plenty of sun and I think they will be ready to plant as soon as the danger of frost is past. The peppers in the top left hand corner look wonderful but they are slower than the tomatoes. I have never had jalapenos that looked as good as these peppers look. 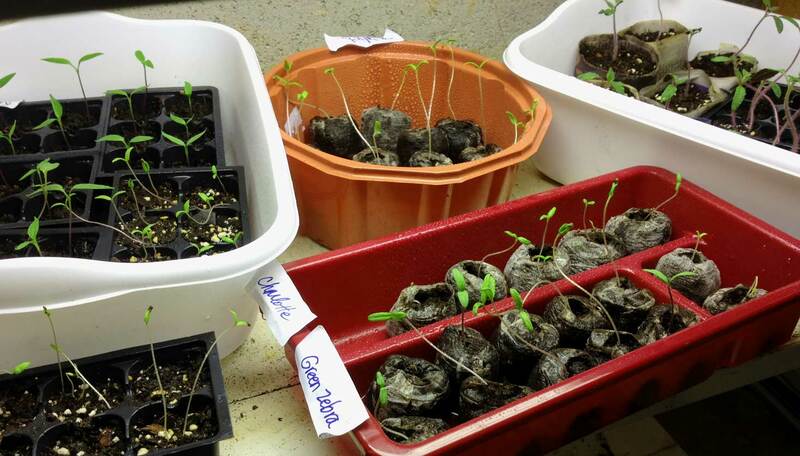 I must admit I love growing plants from seed. I could hardly Bee--lieve it!